I promised Leah that the next sweater on the needles would be for her. We have spent hours pouring over Ravelry and other knitting and yarn related sites, to try to come up with the perfect project. Normally, we find a sweater that we love and then start looking for some appropriate yarn, but this time Leah fell in love with the yarn first. This is Madelinetosh Pashmina, a hand dyed yarn with 75% Merino wool, 15% silk, and 10% cashmere. 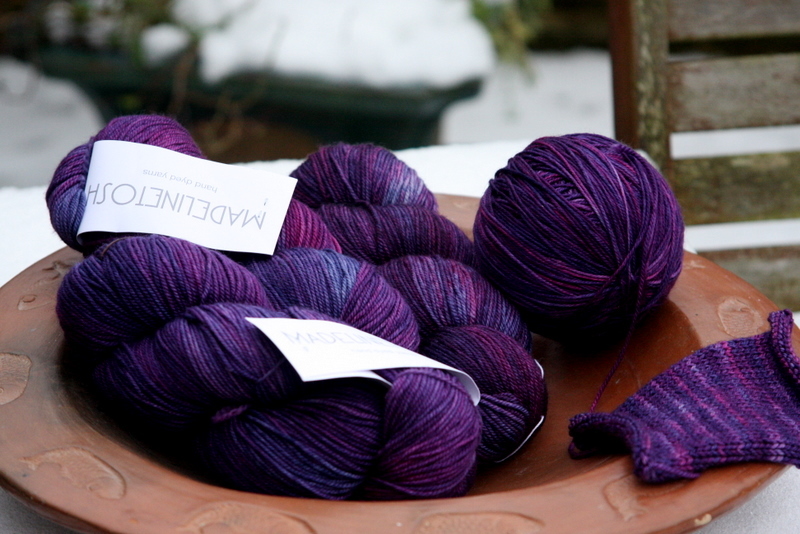 I have never knit with Madelinetosh before, but its admirers are many and vocal. 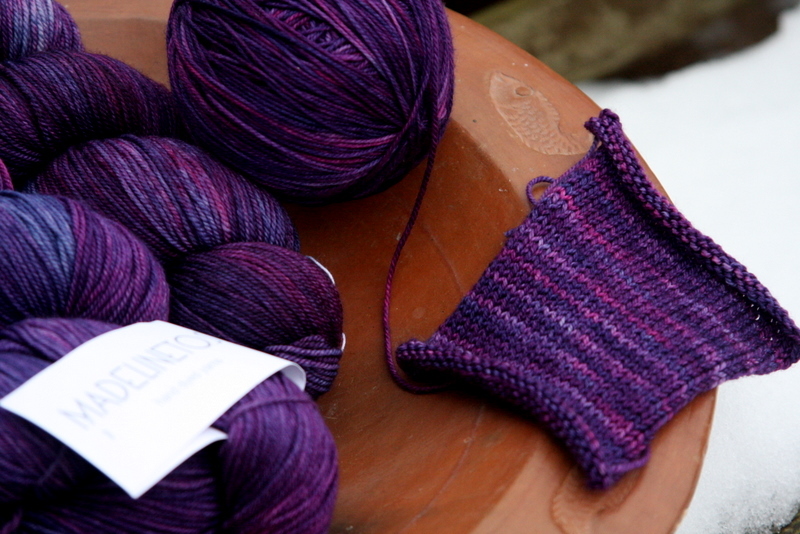 Leah fell in love with this colourway, called Flashdance, and we ordered it right away. One of the problems with ordering yarns off the internet is that the colour is really up for grabs; different monitors show the colours differently and until you hold the wool in your hands you are never sure what you will get. This colourway is luminous; rich and saturated. The light bounces off of it. We took it out in the snow on the weekend to try to capture it on film. 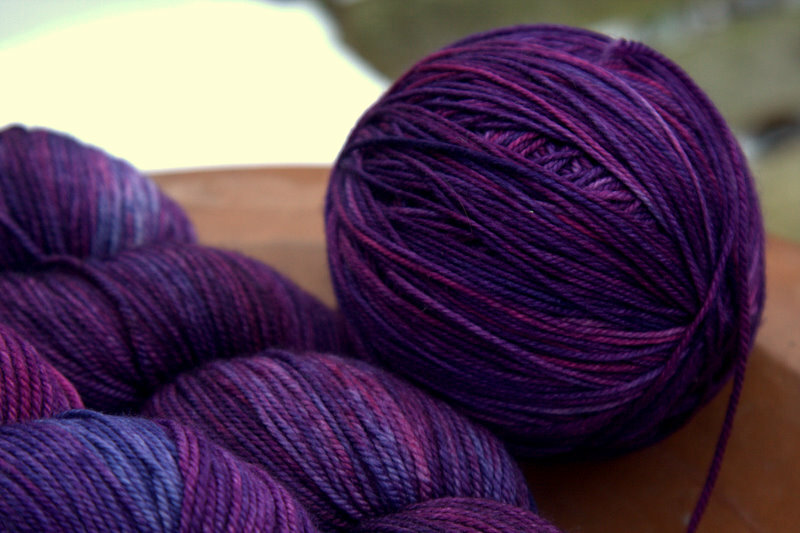 It is a gorgeous blend of purples and blues, really dynamic and flowing. On Saturday, while the Brick pullover was wet and blocked out on the living room floor, I took advantage of the Brick downtime to knit up a gauge swatch. 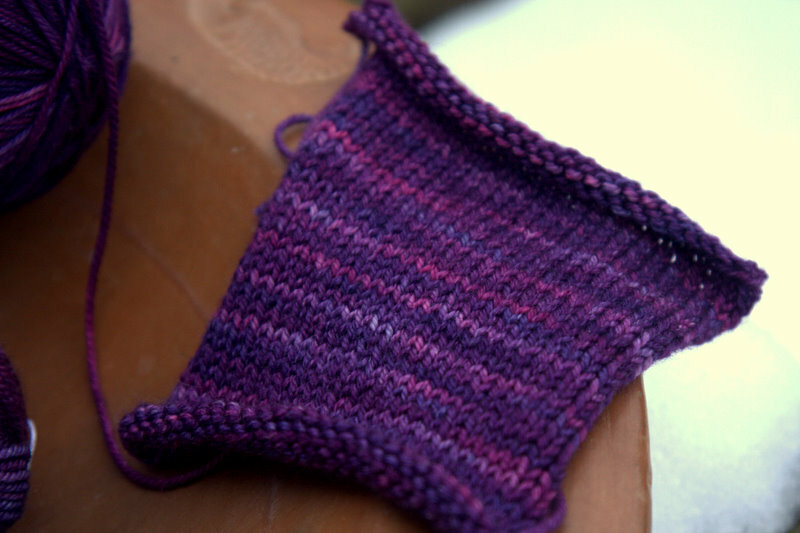 As you can see from the swatch, the colour changes frequently; I believe that this will minimize pooling. (I am hoping to not need to alternate skeins every row, but I notice that most people elect to do so with this yarn.) What you can’t see is how gloriously soft and smooth the knitted fabric is; the stitches are plump and bouncy and the fabric has lots of give. I am really looking forward to working on this project! absolutely love this color-as you know Kelly, purple is one of my three favorite colors. Love the colors in the yarn. Looking forward to seeing what you create for Leah with it. I’m so glad Mary Lou told me about this blog.